The word Keratoconus is formed by two Greek words: kerato, meaning cornea, and konos, meaning cone. Keratoconus is a condition in which the shape of the cornea, which is usually round, is distorted, developing a cone-shaped bulge, resulting in harm to vision. Progression of the condition depends on the patient’s age at the time of the onset. The earlier the onset, the faster keratoconus progresses. The condition is always bilateral and asymmetric – meaning that it affects both eyes, however one eye may be more affected than the other. Keratoconus is a condition that has many causes and is “multifactorial”. It can be inherited and it can be associated with allergic conditions (hay fever, asthma and eczema) its onset is usually during puberty and the earlier it occurs the more rapidly it progresses. It is also seen in contact lens wearers. 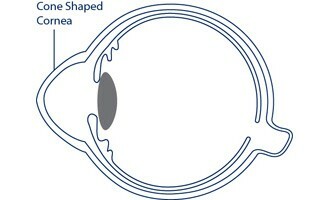 The cornea is a bit more elastic than normal and tends to alter in shape and thin out becoming cone shaped. Rubbing the eyes can aggravate the condition. These can provide good vision in the early stages and often a moderate amount of astigmatism correction is required. Rigid contact lenses and Scleral lenses are required for good vision when glasses do not work. This technique increases the strength of the cornea to prevent progress. Learn more about CXL here. These ring inserts are useful and are used to change the shape of the cone on the cornea, flattening and making it more central. If patients are intolerant to contact lenses and the keratoconus is not excessively advanced, intracorneal rings can enable patients to obtain good vision with glasses and perhaps even consider Toric Implantable Contact lenses to eliminate the need for optical aids altogether. Read more about Intracorneal Rings here. For those who have stable keratoconus and are able to obtain good vision with glasses, the Toric ICL can eliminate the need for glasses and in some patients provide improve vision. Learn more about the Toric ICL here. In advanced stages – either a partial thickness (Deep Anterior Lamellar or DALK) or full thickness (Penetrating graft or PK). Considerable advances using lasers have been made and the preferred option for patients with Keratoconus is to have a Femtosecond Laser Deep Anterior Lamellar Keratoplasty. This development pioneered by Centre for Sight surgeons has been the recipient of a video award at the American Society of Cataract and Refractive Surgeons, San Francisco, 2013. Centre for Sight surgeons are internationally renowned for their expertise in Keratoconus and Corneal disorders. Sheraz Daya our medical director is on numerous boards and committees related to Keratoconus and is on the founding editorial board of the peer-reviewed publication Keratoconus, as well as a founding member of the Keratoconus Expert Group, an international group of Keratoconus specialists.